Artist Keith Robinson, whose career began in graphics and animation and then moved into children’s book illustration, is somewhat of an Olympian himself. Here he shows us the process of taking the beloved classic, The Lightning Thief by Rick Riordan, from his own imagination onto the pages of an immersive coloring book. His coloring book actually tells the story in an interactive way that Percy fans have never seen before. Artist Keith Robinson modeling poses for The Percy Jackson Coloring Book. It was really exciting to have the opportunity to illustrate Percy Jackson’s adventures, but also a big responsibility. The series has a devoted fandom, so I felt it was important to pay attention to every detail. I began by reading the book, making notes, and bookmarking key passages. Disney-Hyperion’s art director, Joann Hill, gave me comprehensive briefing notes, but for each illustration I also went back to the text and read around the scene in question, to make sure I had an accurate image in my mind. I brushed up on my Greek mythology as well, and did quite a lot of research on things like ancient Greek armor, architecture, decorative patterns, and so on. I also gathered reference for several modern locations that appear in the book, like the Metropolitan Museum of Art in New York. The books have brilliant cover art by John Rocco, and there have also been a couple of films, but I don’t think that Percy’s world is as definitively visualized in the popular imagination as something like, say Harry Potter. So while I was very mindful of doing something that I hope will resonate with fans, I didn’t feel tied to a particular look. I thought the best approach was to just immerse myself in the book and to interpret it in my own way. I treated it like illustrating a novel, rather than making a coloring book. You know there’s that coloring book “look,” which can feel rather cold? I wanted to avoid that and just concentrate on making a series of drawings that tell the story in a dynamic way. I certainly hope people will enjoy coloring them, but I tried to make illustrations that can be enjoyed in their own right as well. 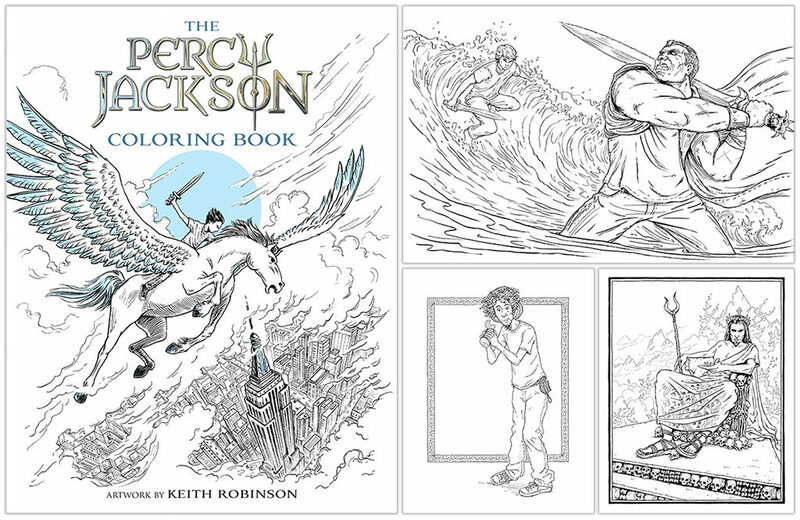 Don’t forget to order your copy of The Percy Jackson Coloring Book by clicking here.